A VERY SPECIAL THANK YOU to our AWESOME friend Collin. Collin asked his birthday guests to bring donations instead of presents. Way to go Collin!! Happy 9th Birthday. We hope you had an awesome birthday.....you deserve it!! A GREAT BIG THANK YOU to a VERY SPECIAL BOY named Nic. 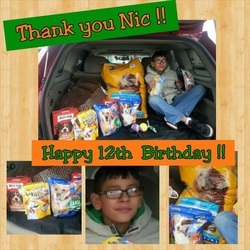 Nic didn't want your typical birthday...he asked his guests to bring donations for Open Arms Rescue of WNY. Way to go Nic!! What a great example you are to others. Thank you so much for donating to our dogs/puppies we really appreciate it. Hope you a Birthday was as special as you are. Thank you so much to the sweet children who participated in the Santa Paws program at Akron Elementary. Instead of doing gift exchanges with classmates, 5 VERY SPECIAL CLASSES opted to collect items for Open Arms Rescue of WNY & the Genesse Animal Shelter in Batavia. A few of our volunteers made a special visit to Akron Elementary with some of our dogs & puppies to say thank you. The children were so excited & happy to see who their donations were going to help....it was adorable seeing the looks on their faces, absolutely priceless. A VERY SPECIAL THANK YOU to Jilly a sweet little lady that just celebrated her 4th Birthday. Instead of giving her guests party favors Jilly had her family use that money to buy items for our dogs & puppies. Jilly is pictured with her older sister Gianna....looks like our dogs/puppies have a couple of cute little angels looking out for them. Happy Birthday Jilly & thank you. We had a VERY SPECIAL YOUNG LADY named Britany stop by at the Eastern Hills Mall Pet Expo with donations for our dogs/puppies. She asked for rescue donations instead of gifts for her 11th birthday! What an amazing young lady.....THANK YOU so much Britany you're an inspiration to others for being so kind. 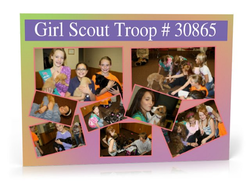 We are so thankful for our friends of Girl Scout Troop #30865....These wonderful girls collected items for our dogs/puppies and held a puppy shower to present them to our rescue. It's amazing what can be accomplished when people work together no matter what their age might be. Great job girls!! We really appreciate your help.